I have to admit, going to a LEGO store is not the same as shopping at a mall – it’s more akin to seeking out a local landmark. Going to a LEGO store is not the same as purchasing LEGO bricks at a Hamley’s or a ToyZone. 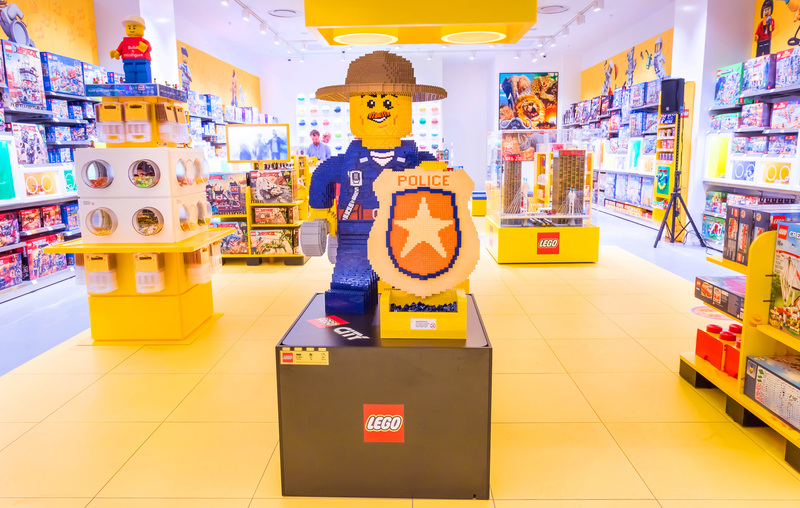 Visiting a LEGO store is an experience in and of itself – entirely unique. I saw The LEGO Movie some five years ago. This most recent Christmas saw my nephew receiving his first bucket of LEGO blocks. I was a big fan of LEGO when I was a kid. At the LEGO store at Sandton City, north of Johannesburg, the environment crawled with excitement. Just as many teenagers and adults hunted and pecked through the Build-your-own Minifig setup, one in which you get a plastic blister-pack that you’re asked to fill with three LEGO figures. Heads, hats & headgear, accessories, torsos, and legs are included in a cube which was packed with LEGO lovers the entire time I was at the store. This entirely unique experience has you carefully considering which pants go with which shirt, whether you want a LEGO head that’s got two faces, or if you’d rather have a sword or a piece of chicken. Chatter around the creation bin revealed that most people impulse-bought the lot. “Oh we HAVE to do this,” and “if you’re making one, I get to make one too,”weren’t uncommon examples of phrases overheard. If the mini-fig bin is made for kids, the fill-a-cup LEGO experience is made for adults. Every single time I’ve been to a LEGO store (Tokyo) over the past several months, I’ve seen at least one person over the age of 20 filling a cup – and rarely a child. It’s here that I also saw a fellow walking around with a list of LEGO pieces he needed for his next big build, checking them off as he found them in the bins. He was being helped by a friendly LEGO employee, one who also may or may not have been letting him know when the next batch would be brought out to the show floor. LEGO is still aimed at kids in public, but behind the scenes they understand that what they’ve got is big business for kids that never grew up. Someone has to make those lovely models you see in LEGO stores – LEGO professionals also had to construct the millions of bricks you see in The LEGO Movie. 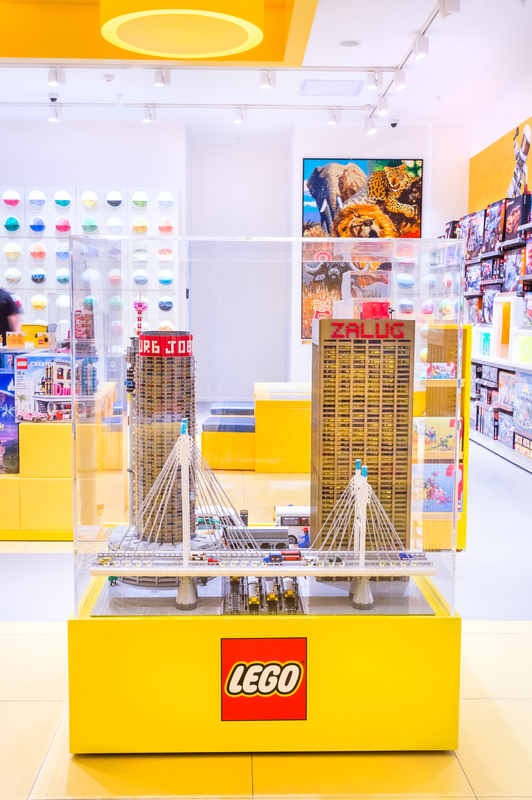 Inside the Sandton City LEGO Store you’ll find several murals made of single LEGO blocks, meticulously placed. Below is one of several masterpieces placed in the middle of the store. Custom-made LEGO sets sit near fully-constructed sets you can buy. Here you’ll see one of the most recent ones, the Mandela bridge and famous landmarks found downtown. There’s even a taxi, too! LEGO’s brand power has the ability to inspire potential professional builders – engineers, artists, and everyone in-between. The 179m2 Sandton City store is close to Sandton City’s Fun District, a level dedicated to family entertainment, and it significantly enhances the centre’s offering for children.